The Maharishi had moved to England in 1959, just about the time the Beatles were starting to come together. After graduating as a physicist, from Allahbad University in India, he worked for a short time before leaving his more worldly path behind, for the life of a neophyte Indian holy man, or ‘sadhu’. Apparently, he spent the next 13 years in study and meditation with his teacher, Guru Dev, before heading west. In London he began teaching a very simple, easy to learn form of Hindu meditation. What seemed to appeal to westerners, like myself, was that inner peace could be accomplished without the traditional ways of eastern asceticism. In this way, the Maharishi was very shrewd. In a radical departure from traditional Hindu teaching, he said there was no conflict between the materialistic ways of day to day living, and the spiritual path as embodied in his form of meditation. 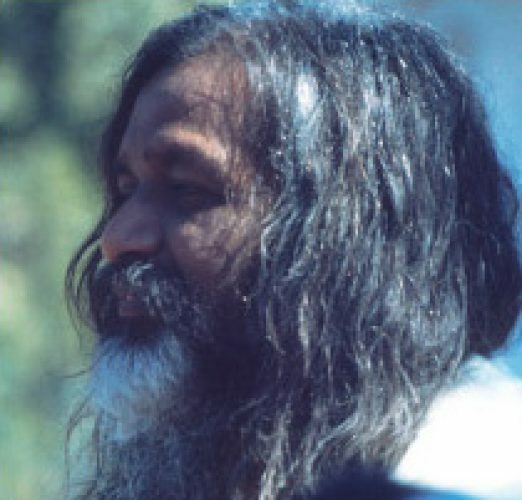 And, even more shrewd, where traditionally spiritual knowledge and techniques are never sold, the Maharishi said westerners wouldn’t value his teachings if they were free. In time, this would make his organization extremely wealthy, indeed. His gift was clearly a packaging masterpiece. And this doesn’t take away from the value of his form of meditation. Early on, the Maharishi even trademarked the name for his system of meditation ‘TM’ for ‘Transcendental Meditation’. He described his technique as a simple, scientific system that brings peace, happiness and success to all who use it. I imagine, this is what attracted Pattie and George to bring the other Beatles along to meet the Maharishi at the Hilton Hotel in London. It was 1967. The next day, Mick Jagger of the Rolling Stones joined John, Paul, George, Ringo and their group for a meditation retreat in Wales. During the train ride the Maharishi explained the illusory nature of life, or ‘maya’ in Sanskrit, and the simplicity of meditation as a way of attaining inner peace. En route, he ‘initiated’ them, separately and privately, giving each of them their own individual mantra. At first, Paul tried to meditate for half-an-hour and couldn’t do it. He spent his first few times trying to stop his mind from reviewing his social calendar, but he liked it. John was fascinated that they were getting into eastern philosophies. George was into it and doing well, and Ringo was struggling with it. But after only one day at the retreat, they learned of the tragic death of their beloved manager, the real ‘5th Beatle’ as they would later say, 32 year-old Brian Epstein. It was Epstein, also from Liverpool, who ‘discovered’ the Beatles when they performed at the now legendary Cavern Club in Liverpool on November 9, 1961. He was then managing one of his family’s music stores and although he knew little about rock ‘n’ roll he had a fine, young entrepreneurial instinct. He immediately signed them as their manager and music business partner, and initiated their make-over from four hirsute, leather-clad, Liverpool rockers into their soon to be famous, trend-setting, mop-haired, band–now clad in matching Doug Millings dress suits–belting out mega-hit after mega-hit. The death of Brian, in what was later semi-officially classified as an accidental suicide from an overdose of barbiturates combined with alcohol, was an unimaginable shock to the four young men barely in their mid-twenties. The Maharishi comforted them, saying that life transcends beyond this physical plane, and that at such a time they must hold loving feelings to support Brian’s spirit as he moved onwards. The next day the Beatles left for home to have privacy for their individual grief. For John and George, especially, the Maharishi and meditation embodied the hope of finding meaning to life’s mysteries. And, I imagine, finding an end to the confusion and pain that plagues life, often when lived unconsciously, no matter how rich or famous you are. Before they left for India, Paul expressed to his friend, singer-songwriter Donovan, that they hoped the Maharishi would give them some of the answers for both personal peace and global peace. The Beatles gave up drugs, for a time, during this period of meeting the Maharishi and going to India. Like many of my generation, smoking marijuana was a pivotal experience in my conscious awakening. It was an invaluable door opener. I was 21, and before trying marijuana I was a bright, talented, frenetic, under-achiever with low self-esteem and barely any conscious awareness of either who I was, or what I needed and wanted below the surface level of myself. The introspective, increased awareness aspect of ‘getting high’ allowed me to look within–to begin to see who I was, and who I wanted to be. It was also lots of fun. Then, having read Aldous Huxley’s The Doors of Perception, I explored further using the soft psychotropic drugs: LSD, mescaline and psylosibin. For me, it was never about ‘Let’s get stoned and party!’ I was frightened of ‘bathtub acid’ and of having a ‘bad trip’, and I never took a psychotropic without first having it laboratory tested by a friendly pharmacologist I knew. Although it was truly helpful, within a couple of years I found ‘getting high’ actually brought me down. I was more tense ‘stoned’ than ‘straight’. I was more perceptive ‘straight’ than ‘stoned’. Hallelujah! For me, drugs were about getting into life, not avoiding life. Going deeper, not shallower. And while people still use soft drugs that way, and sometimes even get such benefits when it is not part of their intentions, unfortunately it’s often a tool of escape from one’s own inner self. It was at that point, when getting high was occasionally fun, and more often not, that the next step for me was to get away from the environment that had had so much influence in forming me, and I left for India. It seems that often we only need to consciously know the next healthy step in our unfolding. Lao-tzu wrote: “The journey of a thousand miles begins with one step.” And for many of us, including John, Paul, George and Ringo, that next step led to long-known wisdoms of the East. To meditation. To Rishikesh. Personally, I had been brought up with the firm belief that there was no God, nor goddess, nor spirit, nor soul, but the beneficial results of meditation immediately dispelled my earlier cynicism. I was, though, somewhat turned off by both those meditators who worshipped the Maharishi, and by his grandiose claim that meditation would lead to world peace. I was reminded of this during one of the Maharishi’s daily press conferences, just outside the ashram gates. As he sat, one of his disciples holding a large black umbrella above his head to shield him from the sun, a bouquet of yellow and orange marigolds in his hands, an American reporter asked, “What success have you had here in India?” The Maharishi said that he’d had little success but was now going to increase his efforts. He added, “The Indian people are poor and they are lazy and meditation will give them the energy and drive to work harder and better themselves.” The reporter tried to suggest that poverty was not a simple matter of laziness. The Maharishi just giggled in his charming but evasive way and said, “With meditation they will overcome their poverty.” I was deeply disappointed by his answer. Indians are absolutely not lazy, many toiling 12 hours a day in the blistering sun building roads, houses, tilling the land, harvesting, all of which I had already seen while filming across Gujerat and Rajasthan. The same reporter then asked, “What do you think about American young people?” The Maharishi’s answer shocked me. “They should stay in school and obey their parents,” he said, “and they must obey the leaders of your country who are more informed and qualified than they.” He added that he disagreed with nuclear disarmament and that America was right to be in Viet Nam. *From the documentary, ‘The Beatles Anthology’.